Thunderstorms are most frequent in the Midwest, occurring on average, on 55 days a year as compared to only 25 days in the extreme northern parts of Minnesota and Michigan. billion per year, but thunderstorms also help the Midwest by providing between 40 percent (northern Midwest) to 60 percent (southern sections) of the total annual precipitation. 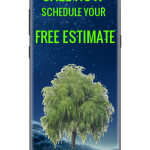 If your tree’s are not ready to weather the storm, Tree-Mend-Us Care is the go to experts in the Kansas City area with Decades in Business. We can handle any job big or small and fully insured for a piece of mind. to the environment, crops, and property. The cold season has snowstorms, ice storms, high winds, and sleet storms, also deadly and damaging to the environment and property.